More Rain Expected As Helicopters Search For Stranded Flood Victims : The Two-Way Rescue helicopters were back in the air over Colorado's Front Range Monday. 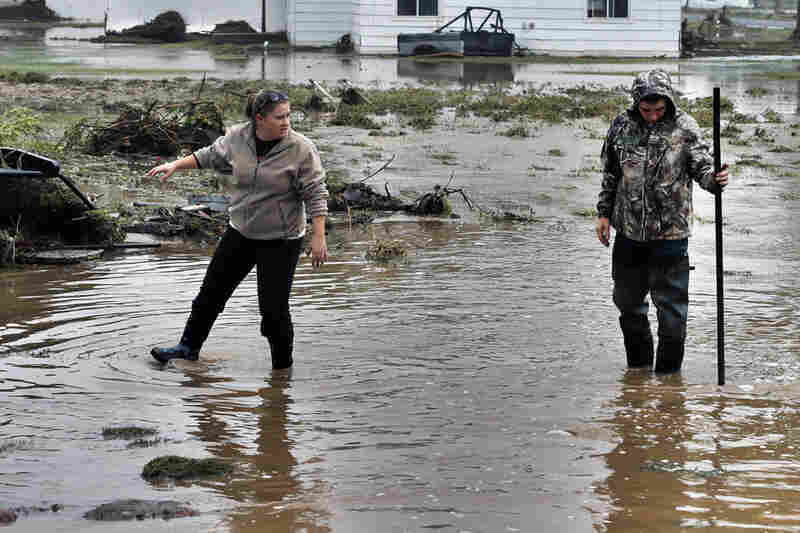 Historic flooding has killed at least six people, left hundreds more stranded and unaccounted for, and forced nearly 12,000 to evacuate their homes. Miranda Woodard and Joey Schendel salvage and clean property after days of flooding in Hygiene, Colo. Mountain towns that had been cut off for days by massive flooding slowly reopened Monday, to reveal cabins toppled, homes ripped from their foundations and everything covered in a thick layer of muck. A woman walks with her two boys in Longmont on Sunday. Forecasters said more rain was expected Monday across Colorado's Front Range and the weather likely wouldn't clear up until Wednesday or Thursday. A road crew works on a stretch of highway washed out by flooding along the South Platte River in Weld County on Saturday. Hundreds of roads in the area have been damaged or destroyed by the floodwaters, which affected parts of a 4,500-square-mile area. 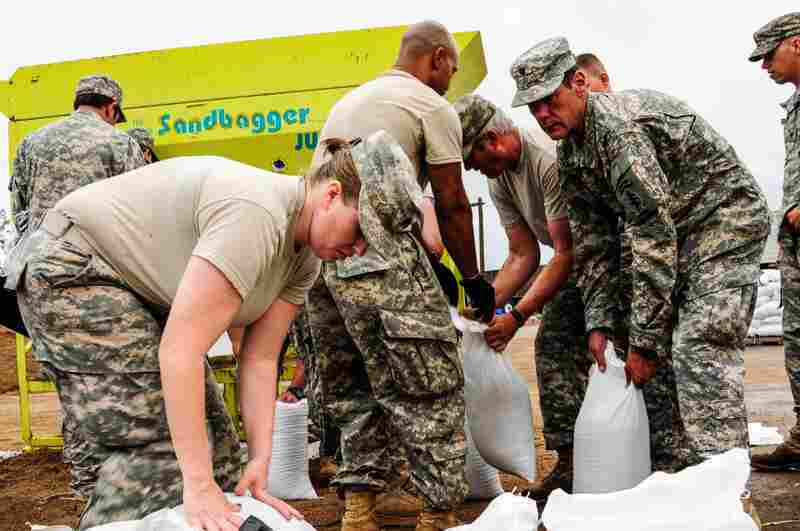 Members of the Colorado National Guard, along with civilian emergency response agencies, fill sandbags at the Arvada Fire Protection District Training Center. 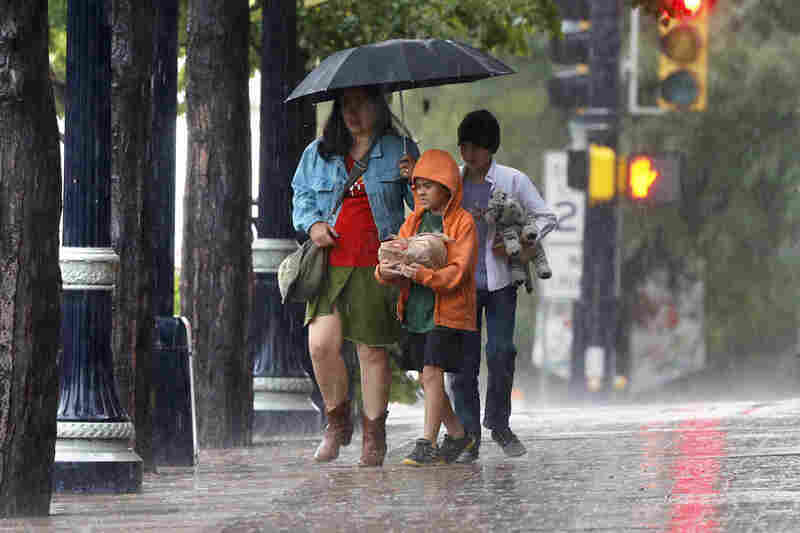 A 73-year-old record for precipitation was broken for the month, according to the National Weather Service. Julie DeGraff pulls back a curtain to reveal the damage inside her home in La Salle, which had more than a foot of standing water inside. The historic flooding forced thousands to evacuate the area. Helicopter crews rescue individuals stranded after severe flooding shut down major roads. This post was last updated at 6 p.m. ET. Helicopters were back in the air on Monday over the 15 counties across Colorado's Front Range where historic flooding has killed at least seven people, left hundreds more stranded and unaccounted for, and forced nearly 12,000 to evacuate their homes. In a news conference, Colorado Gov. John Hickenlooper said 21 helicopters were conducting "search and rescue missions," and other teams were trying to assess the damage to transportation infrastructure. 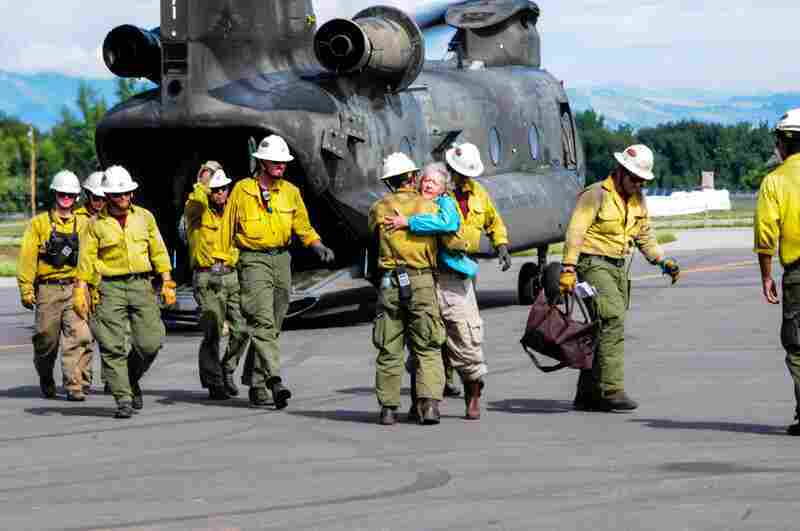 Bad weather grounded the helicopters Sunday, leaving many people still waiting for help or to be evacuated, our colleagues at KUNC report. "The number reported missing has fluctuated. As of Sunday afternoon the estimate was 1,253 — with most of those being in Larimer County. Many areas, like Estes Park, were without phone or cell service but have slowly been regaining contact, leading to rapid changes in the unaccounted for. "Officials are slowly accounting for residents, as they cross reference names with Red Cross and shelter listings. 'So we have a master list that will get shorter — hopefully far, far shorter, and time goes by and we cross reference where each of those parties are,' said Nick Christenson with the Larimer County Sheriff's office. "The death toll rose over the weekend. In addition to four previously announced fatalities in Colorado Springs, Jamestown, and Boulder, two women — one 60 and the other 80 — are both missing and presumed dead in the Cedar Grove area of the Big Thompson Canyon." 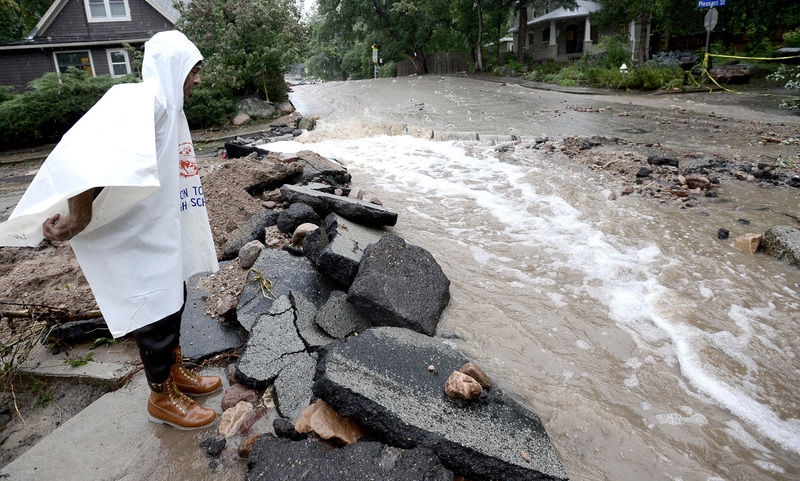 John Hoffenberg watches as floodwaters flow down a street in Boulder, Colo., on Sunday. While the weather was good enough to get helicopters back into the sky, The Denver Post warns that "more rain is expected and dry, blue skies aren't likely until Wednesday or Thursday. 'It's a little bit drier, but we're definitely not out of the woods yet,' Todd Dankers, a forecaster with the National Weather Service, said Sunday." 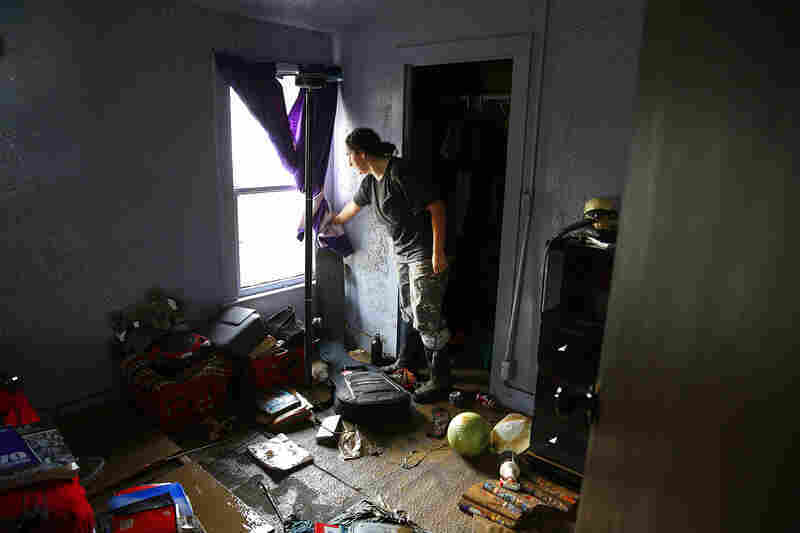 According to the Los Angeles Times, about 1,500 buildings have been destroyed by flooding over the past week. Nearly 17,500 have been damaged, the Times adds. About 2,400 square miles of area have been affected. "Agriculture fields have been flooded with water, damaging crops that haven't yet been harvested. Meantime, the oil- and gas-rich area is spotted with hydraulic fracturing rigs and equipment. "Weld County Emergency Management Director Roy Rudisill says so far only one oil line has been compromised but no spilling into flood waters has been detected. "Rudisill says oil and gas companies have prepared for the flooding, shutting off lines and equipment earlier in the week." In a televised press conference, Colorado Gov. 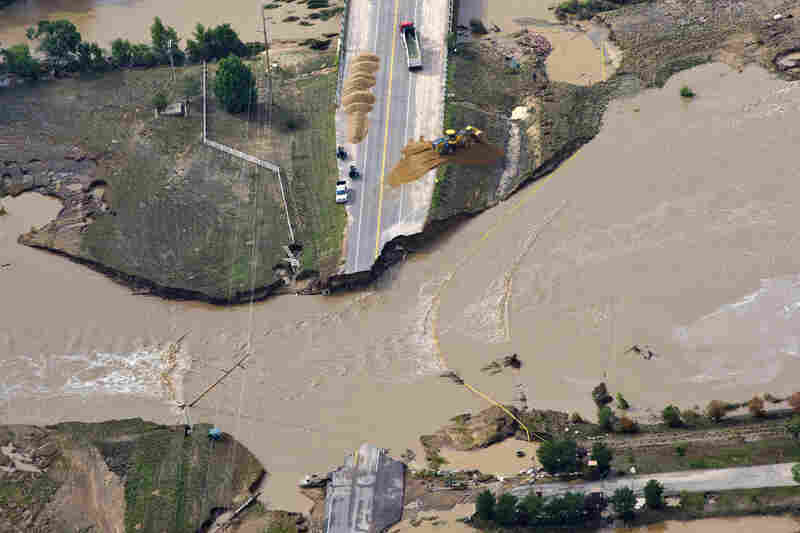 John Hickenlooper said the recovery effort would be "a challenge." He said during an aerial tour he saw that small communities were essentially cut off from each other. He said that 21 helicopters were in the air and 10 teams of the state's Department of Transportation were assessing the situation.